We are engaged in offering Timing Pulley that are extensively used in various industrial applications. These are essential in different equipment where timing of both the drive is precious and the display ratio is significant. Besides, these have advantage over other pulleys in the case that it can be eliminated slippage and maintain constant angular velocity. These are manufactured using carbon steel/alloy steel/aluminum with hardened teeth as per the ANSI BS standard, which make these reliable and durable. Emco Engineering was established in the year 2008. With two decades of hard perspiring years, we have achieved a respectable position in the industry. 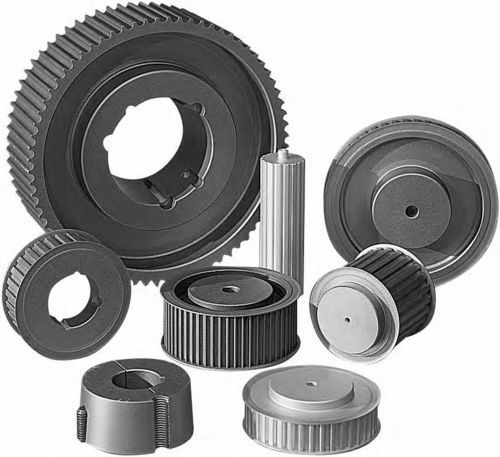 The products offered by us are Pulley, Chain, Sprocket Chain wheel, Coupling, and Gear and Spares. In addition, we also offer Gear Box, Anti Vibration Mountings and Plummer Block . Owing to the high end features like high tensile strength, optimum tolerance capacity and longer functioning life, these are highly acclaimed in the market. Backed by sound infrastructure and a team of competent professionals, we have been able emerge as one of the distinguished organizations in the industry. Our professionals strive hard to understand the varied industrial requirements and manufacture the products keeping in mind the diverse specifications as per the international quality standards. Before delivery of the consignments, our strict quality controllers ensure the flawlessness of the products by conducting various checks and tests. Owing to our transparent business policies and on-time delivery of the products, we have established major markets in the Indian Subcontinent, East/Middle Africa, North Africa, South/West Africa, East Europe, North Europe, Middle East, South/West Europe and North America.